There are art museums, science museums but a refrigerator museum? While refrigerators are certainly not the most common museum exhibit, they exist. Even those who haven’t taken classes in refrigeration, can appreciate just how far the technology has advanced. People looking for a different experience can go to one of these refrigerator museums and exhibits. The American Society of Mechanical Engineers (ASME) has what may be one of the largest collections of antique refrigerators in the United States. The Refrigeration Research Museum is located in Brighton, MI, but the collection can be viewed by appointment only. Models displayed from times past that are available for viewing include the 1918 Kelvinator condenser unit, the 1919 guardian condensing unit, and an operational 1936 Coldspot Refrigerator. The museum is also home to lesser-known antique refrigerators, such as the 1936 Gunow-type SD household refrigerator, the only type of refrigerator to use the refrigerant Carrene. The London Science Museum has a little known gallery called, “The Secret Life of the Home.” This gallery showcases early versions of many common household appliances including sewing machines, washing machines, toasters, cookers, and irons—and old fashioned refrigerators. The refrigerator models on display include an insulated wooden ice box made by Seeger Refrigerator Co. sometime between 1880 and 1920; an early Kelvinator refrigerator model; a 1934 “Monitor Top”, which is an electric refrigerator with the compressor oddly mounted in a circular unit on top, made by B.T.H. (aka General Electric); and a Shelvador Electric Compression Domestic Refrigerator made by Crosley sometime between 1930 and 1940. This particular model is noteworthy because it is the first refrigerator model to include shelves and compartments in the door and not just inside the refrigerator. The Western Pacific Railroad Museum in Portola, California, has one of the most complete collections of refrigerated freight cars in the United States. The refrigerated cars, commonly known as Reefers, include some of the first wooden cars that used large blocks of ice to keep perishable items cool as they were transported. Other car models include early diesel-powered mechanical refrigerator units and ultra-modern cryogenic refrigerated cars that used carbon dioxide to keep items cool. These museums and exhibits are not the only places where one can see an old fashioned refrigerator. Some antique refrigerators can be viewed at the National Museum of American History. Whippany Railway Museum is home to a ventilated refrigerated car. Those who are interested in seeing antique refrigerators place will find that these museums are some of the best places to visit. 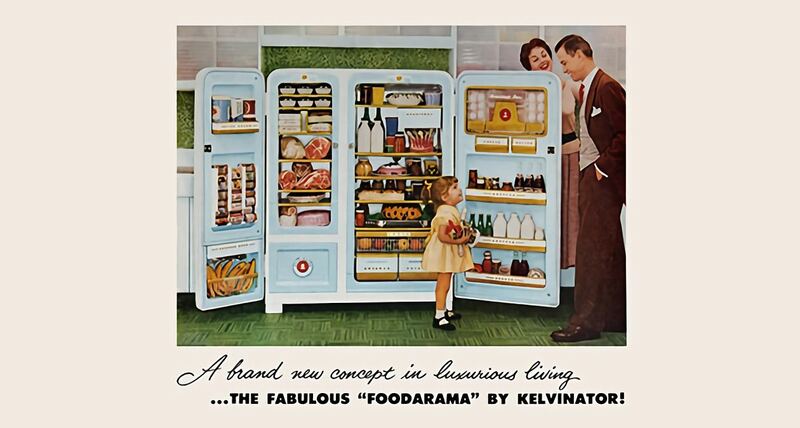 Many inventors have contributed to advancements in refrigeration technology. New technology continues, from ancient cultures using ice to keep food cool and fresh to smart refrigerators that can be programmed to track expiration dates. Most people don’t actively think about their refrigerators but all would agree how important they are. Who knows what the next refrigeration trend will be. Today’s refrigerators will be in tomorrow’s museums. Interested in learning the mechanics of refrigeration technology? Join RSI for our open house event.